2015 PEOPLE: Crowdfunding OpenSim development. It works. Crowdfunding OpenSim development. It works. In OpenSim: A scripting function was generally unusable because of a serious bug. Talla Adam, in Opensim Virtual, proposed a crowdfunding solution: Donors would collectively pledge money to create a bounty of $2000 (USD), to be paid to the person developing a solution to this problem. OpenSimWorld: HyperGrid Destinations Directory New! A video of the new Hobo Island, recently rebuilt. To go, press page up. Mary Wickentower (Polished Puppet Productions) presents "Cinema! The Return", thanks to a generous land grant from the LEA Endowment for the Arts, Round Eight. The focus is themed and RP sets to film machinima. Kitely world pages and hypergrid landing points default to 128,128,nn. You can put the welcome site at that point. But you may want another place. Here is a simple way to move it. Create a parcel to includes both the 128,128,z and your choice. This only creates a force landing spot in the parcel you use. NMA & The Sun & Moon Group Present! Matthew Broyles 11AM PST The Matthew Show Returns! Joe Rizzo 12PM A Man, A Guitar & sometimes a looper! Combining existing music with a video made in a virtual world is becoming an art. The art lies in selecting the scene and creating the video to match the music. The Hobo Pawn Shop, the Bodega Supermarket, and lots of other things in this vide are the work of Arcadia Asylum, available free in many places in Second Life and in OpenSim. This work is always free from legitimate distributors. So it is time to thank my readers. And the people who put my blog posters on their land. 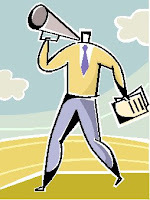 And the people who pass on the links to my articles in Google+ and Facebook. And the people who use my curation features to research something about virtual worlds. BTW, the count has been going for nearly 5 years, so the blog is averaging over a million hits a year. Objective: The goal of this blog is to show people what they need to know to get the best out of virtual worlds and to suggest lines of creative thinking on how to exploit the potential of virtual worlds. From a hired hand who finally comes home, to a man who will never walk the New England woods again for his beloved native orchids, Robert Frost paints his metaphors into the lives of country people in a rich and formidable land. 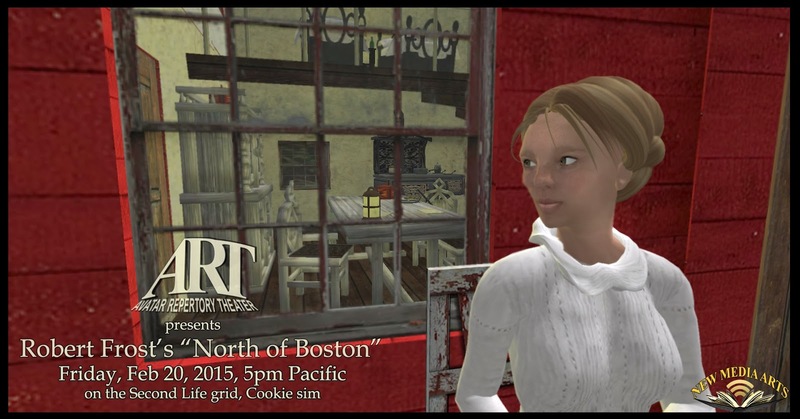 AVATAR REPERTORY THEATER PRESENTS presents Frost's 1915 modernist masterpiece "NORTH OF BOSTON". ACTORS: Em Jannings, MadameThespian Underhill, Sodovan Torok and Ada Radius. SETS by Ada Radius, featuring the artwork of Aley. All pieces free to copy. 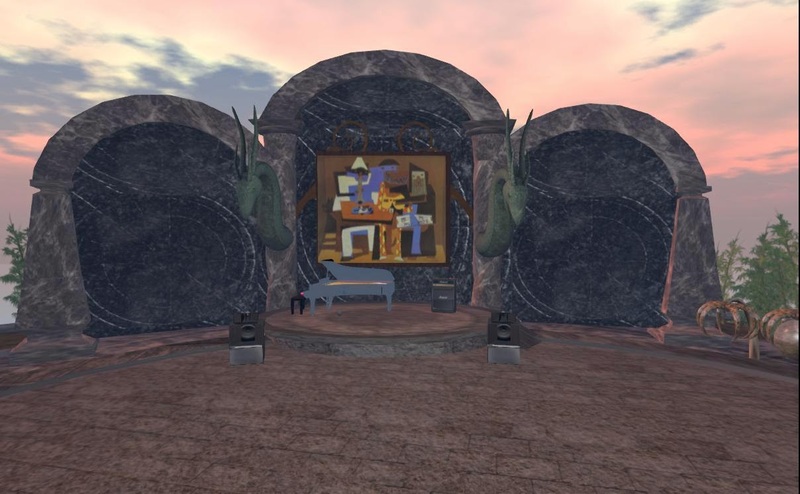 2015 MUSIC: A musician's life in virtual worlds. From Durango to the world. Drax files. A musician's life in virtual worlds. "I can do a world tour in one day", he says about his gigs in Second Life, where he plays solo shows as well as collaborative 'multi-streams' with fellow musicians from all over the world: "I can feed my chickens during the day and play concerts at night." "I do not see a conflict between the virtual and the natural world!" says Indie Musician Oblee. He lives - with wife, chickens and a brand new puppy - on a remote 7 acre piece of land in Durango Colorado, but through virtual reality he can connect to a global audience: "I can do a world tour in one day", he says about his gigs in Second Life, where he plays solo shows as well as collaborative 'multi-streams' with fellow musicians from all over the world: "I can feed my chickens during the day and play concerts at night." This week Ngagpa Writer is guest host at the Short Poetry Workshop for the Ghazal, which is a Persian poetry form from the 10th century. The Ghazal has couplets with a recurring word or phrase throughout the poem. Ngagpa will teach us all about this ancient form, so come learn, write and share the Ghazal. "Make Thinkerer break up" challenge. Or can you? You can try. And maybe do it. 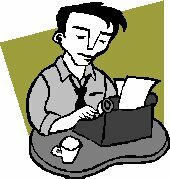 Write (or find) a short narrative that tells of a funny situation. Put it on a note card, bring it to Lauren's show. Thinkerer will read it as part of the comedy show. If Thinkerer can't read it for laughing, you win. No prize, but you get kudos as one of the top comedy writers in Second Life. Come to enjoy the comedy. Come to perform (and later show your friends the video). Come to hear Thinkerer try to read your funny narrative without breaking up. Or take the stage and read your own material. If you can read it without breaking up. Our own Kayden O'Connell is nominated for the AviChoice Awards! Dancing in the virtual worlds. Somebody asked why we don't show dancing in virtual worlds. So here is dancing in virtual worlds. "Gotta dance" is a song from "Singing in the Rain." 2019 PEOPLE: Building communities in virtual worlds. Common interests, easy communication. Virtual worlds: Where is everybody? How do I find people? The BeatThis List. Kitely Market. "Our mission is to create a critical mass of buyers, sellers and content in order to help the Metaverse evolve from a collection of separate virtual worlds to a unified ecosystem." We need things to make the Hypergrid serve us better. (See Maria's report.) In the BeatThis List, I will develop a list of what we need and what I think is the best we have now. I may be wrong. If so, people will tell me in the comments section. And this short list can't be all we need. So I expect to be updating this article. So use the comments section to suggest more needs. Grid welcome points. Make people glad they came. Keva Planks collapse. How does the physics look to you? Build once, destroy many times. Try many ways to destroy. Could you make a marketable package out of this? You must promote your Opensim activity if you want to draw an audience. There is no big advertising campaign drawing people into your grid. If you want a promotional campaign, it is up to you. At least until there is a Hypergrid Chamber of Commerce. What is your target audience? What kinds of people will be interested in this? How can you reach these people at low cost? Why would these people be interested in what you have to offer? What would catch the attention of these people? How can you reach people via the web? How can people easily get to your place? Can you make it easier? 2014 ART: VIDEO: MachinimUWA VII: Chic Aeon's "The Ghost in The Machine"
"The Ghost in The Machine"
This film asks "what if?" Only you can decide. Music: Stranger's Moments "the vastness of the cosmos"
downloaded from JAMENDO and used under the creative commons license. 2015 HOBBIES: VIDEO: B52 bomber in 'Nam. WW2 Dogfight competition. Flying Circus. B52 bomber in 'Nam. Flying Circus. WW2 Dogfight. 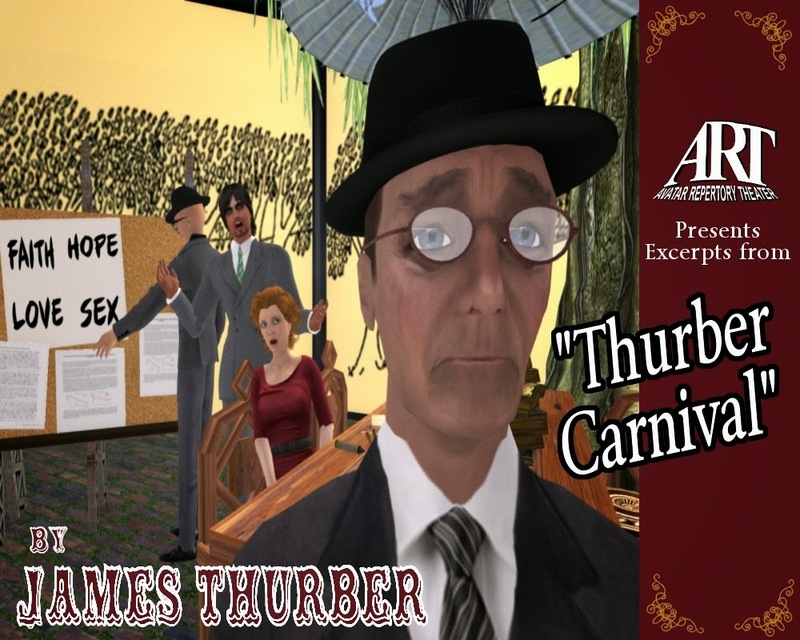 2015 STAGE: Thurber carnival. Avatar Repertory Theater. Feb 6th, Avatar Repertory Theater. James Thurber was one of the most popular humorists of his time, writing for the New Yorker for almost 30 years. The actors of ART will be exploring his work, including short stories like "The Unicorn in the Garden" and "The Secret Life of Walter Mitty". Please join Corwyn Allen, Ada Radius, Sodovan Torok, MadameThespian Underhill and Kayden Oconnell as they perform live and in voice, using an adapation of The Thurber Carnival, done by Ada Radius. The fully staged production includes some of the remarkable sets built by the artist Aley. It all starts at 5 pm SLT on Friday, Feb 6. Surreal trip from Tarrytown to Manhattan. The Hudson line is a collaborative creation by poet Karima Hoisan and scripter Dale Innis. Based loosely and surrealistically on a train line from Tarrytown New York to Manhattan, it is a fanciful flight of fancy at every station. This may work in other viewers, but I have not tested them. If not, paste the line into the world map search bar, teleport if found. Turn on media to play automatically and turn up sounds. Region default is early morning sunrise. You may prefer midday. Use the teleport in front of the sign to go to the train. 2015 OPENSIM: PROMO: BIZ: HGProject. Should your grid have a Chamber of Commerce? Should your grid have a Chamber of Commerce? A Chamber of Commerce (US and others) works to foster the interests of the local community (a city, for example) A virtual world grid is much like a city--I like the term virtual village. It might make sense for people in a grid to organize a community group for the purpose of promoting and growing the grid. A chamber of commerce (or board of trade) is a form of business network, e.g., a local organization of businesses whose goal is to further the interests of businesses. 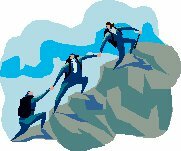 Business owners in towns and cities form these local societies to work on behalf of the business community. They generally interpret this mission broadly, assuming that working in the interests of the city (say, for population growth) is also in the interests of the business community. Do we already have anything like a Chamber of Commerce? What would a grid Chamber of Commerce do? Would this only work for businesses? Is OpenSim United going to be an OpenSim Chamber of Commerce? OpenSim United at the OpenSimulator Conference 2014. 2015 PEOPLE: Where is everybody? Space makes virtual worlds look empty. Space makes virtual worlds look empty. That is a picture of a crowd? Actually, there are fewer that 20 people there. If they were in a virtual world, they would probably be spread over hundreds of sims. The place would look empty. Hundreds or thousands of sims make for mostly empty space.